“I don’t like fishcakes” my seven year-old helpfully offered as I stood over the stovetop. And to be fair, my two children aren’t big fans of fish when it’s cooked. They prefer much of their seafood raw: sashimi, ceviche, freshly shucked oysters. You know, all the things at the steeper end of the menu when we’re eating out. “This fish has been smoked”, I countered, “Which I think you’ll like, especially because it’s mixed with potato which you love”. I think I managed to nab about three of these, as many as I could get in before the fishcake doubter and her sister had cleaned up the lot of them. 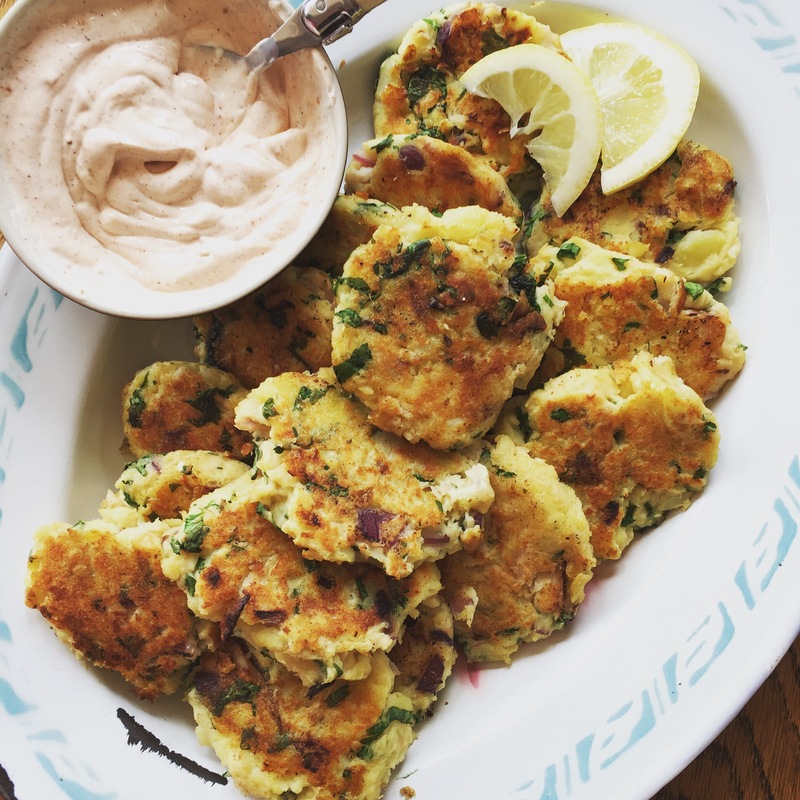 Make these with any smoked fish or cooked flaked fish would be great too. Change out the coriander for parsley if you like and the red onion for brown or spring onion. Add any seasonings you like: the recipe here is very simple but tasty nonetheless, seasoned only with salt and white pepper. Tip Pablo Red Chipotle Salt is a nifty little seasoning blend I discovered a while back and happily, it’s not full of additives or bulking agents. It lends a citrusy, smoked chilli zing to so many dishes. Boil potatoes pieces until tender, about 12 minutes. Meanwhile sauté onion and garlic in a little olive oil till fragrant; set aside. Drain potatoes well and place in mixing bowl. Add cream and mash roughly, you want it a bit chunky in texture. Fold through the rest of the ingredients, checking seasoning. Form into patties a little smaller than size of your palm and cook in a heavy based frypan (I prefer cast iron) with a little olive oil. Add a little oil between each batch of fishcakes and keep the cooked fishcakes warm in oven till ready to serve. Serve with sour cream (or creme fraiche) mixed with a little Red Chipotle Salt and a squeeze of lime.